Equipment for determining cathodic disbondment of coated pipes. Our universal tensile tester is computer controlled, and provides us with real-time complete and concise test results and print outs. These are available for customers to view upon request. In order to check the toughness of parent metals and welded specimens, impact tests at room temperature, zero and subzero temperatures can be carried out. 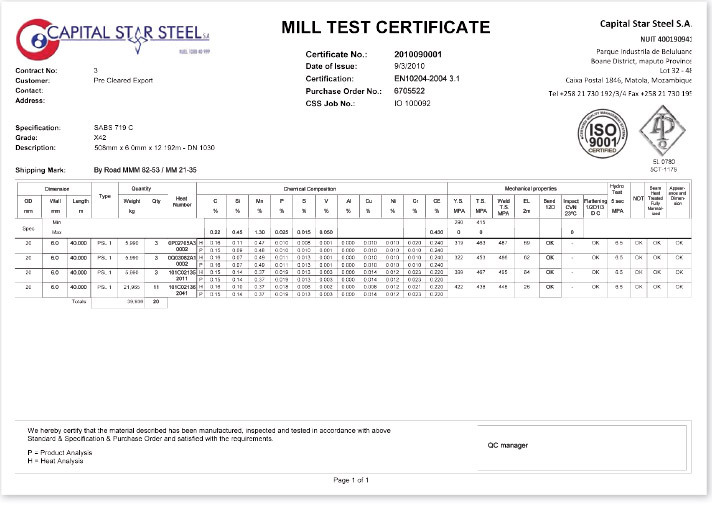 Chemical Analysis is carried out to check if the steel coil received is in accordance with the specifications and steel mill test certificates before commencing production. This validation analysis will draw immediate attention to any excessive amounts of trace elements, which may affect welding and mechanical properties. Our automatic multiprobe ultrasonic flaw detection system monitors the weld integrity and measures the weld bead geometry after internal and external scarfing. Therefore we can ensure consistent quality of the weld seam, giving you peace of mind that the most critical zone in the pipe is made to the highest quality standards possible. The welded seam and the adjacent heat affected zones are tested using 4 to 8 ultrasonic flaw detection probes. Flaws detected are automatically marked by spray guns. Final testing is carried out offline after hydrostatic testing, to ensure that no cracks have developed during the pressure testing process. The hydrotester has the capability of pressure testing pipes to a maximum of 28 MPA. The process involves clamping pipes between two test heads and then filling the pipes with water and pressurising to the required specified test pressure. The applied pressure is held for between 5 to 10 seconds, to ensure no leakages, cracks or sweats are detected.